3. Keep flame low. Add ginger-chilies paste, red chili powder, coriander powder, turmeric, chaat masala powder, black pepper powder, cumin seed powder, salt to taste. 11. Using greased hands take a small ball of a mixture, flatten it & put 2-3 small cubes of processed cheese. Roll it from all sides covering it & then roll in oval shape. 12. Prepare all cheesy cutlets in the same way. 14. Put vegetable cutlets to set in the refrigerator for 30 min. 16. Once they are golden brown on one side turn it over & fry on another side. 17. Take out on a paper napkin once golden in color. 18. 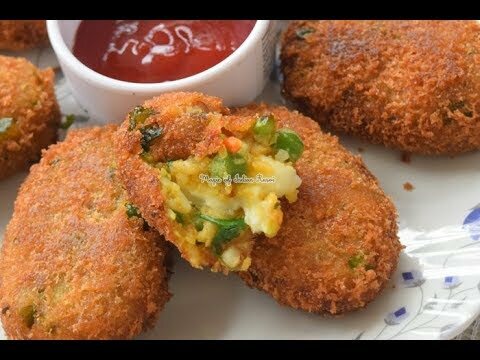 Fry remaining cheesy vegetable cutlets in the same way.